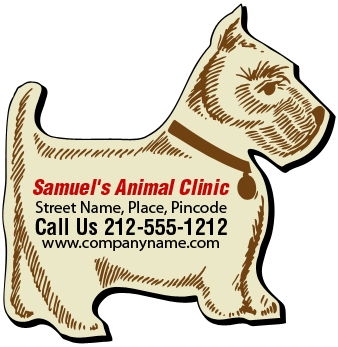 Build reliability around your new veterinary clinic by investing in this custom 2.25 x 2.31 inch dog shape animal clinic magnets 20 MIL. It works perfect for private veterinary practices, pet shops, pet-friendly businesses, and pet supplies –trying to attract new leads to their business. These magnets are offered in economical prices, which mean marketers can employ them for bulk gifting without any second thoughts. Free art set up, free online design proof and free shipping –are prominent value advantages that are offered with this purchase. Request a quote to know price savings that you can avail on bulk ordering these customized 2.25x 2.31 inch dog shape animal clinic magnets – 20 MIL.